If you are a Windows user and you can access the Raspberry Shake’s webpage at http://raspberryshake.local/, then you can ignore this section of the manual. Due to a limitation in Windows, http://raspberryshake.local/ will not work for some users. If you have iTunes installed, things will probably work fine. At the heart of the problem is the fact that Windows does not support DNS local discovery so things are not as simple as just plugging in your Raspberry Shake and navigating to http://raspberryshake.local/. In order to display the Raspberry Shake web config, you must use the actual IP address as the URL instead of ‘raspberryshake.local’. So the question becomes: how does one find the IP address once it’s been plugged in? We recommend installing the Bonjour browser (Method 1) which will discover all of the IP addresses of all devices connected to your network but you can also use the command-line (Method 2). Install the Bonjour browser. This browser can be used to inspect the network and find the IP of your Raspberry Shake. Bonjour is a “helper app” than can be used exactly in situations like this to find the IP. Start Bonjour, it will display all of the devices it finds on your local network. Select the item named ‘raspberryshake’. The local IP address is displayed at the bottom panel (see screenshot below). Proceed back to any browser and provide the URL: IP.from.previous.step. iTunes comes with Bonjour by default. Somehow http://raspberryshake.local/ works when you have iTunes installed but not just Bonjour. So iTunes is doing something internally with DNS local discovery. Some routers do not retain the previously assigned IP when the Raspberry Shake is power-cycled. So, if your unit is power-cycled, the local IP may change, which will require you to re-identify the IP. Replace “192.168.1” with the first three groups of your IP address. Identify the Raspberry Shake’s IP looking for the IP address that corresponds to the “Physical Address” beginning with b8:27:eb. 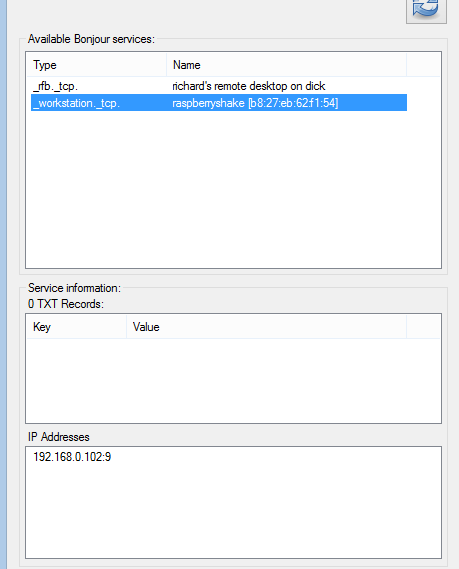 Another solution for Windows power users is to log into your router’s dashboard and proceed to DHCP::Client list and ascertain which device is the Raspberry Shake. When there are only a few devices, this should be relatively straight-forward. But when there are many “unknown” types in the name/description field, it will not be obvious but you should be able to identify the Raspberry Shake using the MAC Address which will start with b8:27:eb. Another option might be Advanced IP Scanner. It returns the IP and MAC addresses for everything on your network. Look for the MAC address that begins with b8:27:eb. This is your Raspberry Shake.